Since I started a new job I also wanted to try out MacBook as my new laptop. I’ve never been a Mac user, but there seems to be a large group of people who think Macs are the best, so I needed to find out the goodness of Macs myself 🙂 A quick tip: Don’t upgrade to Yosemite if you laptop is bound to Active Directory. 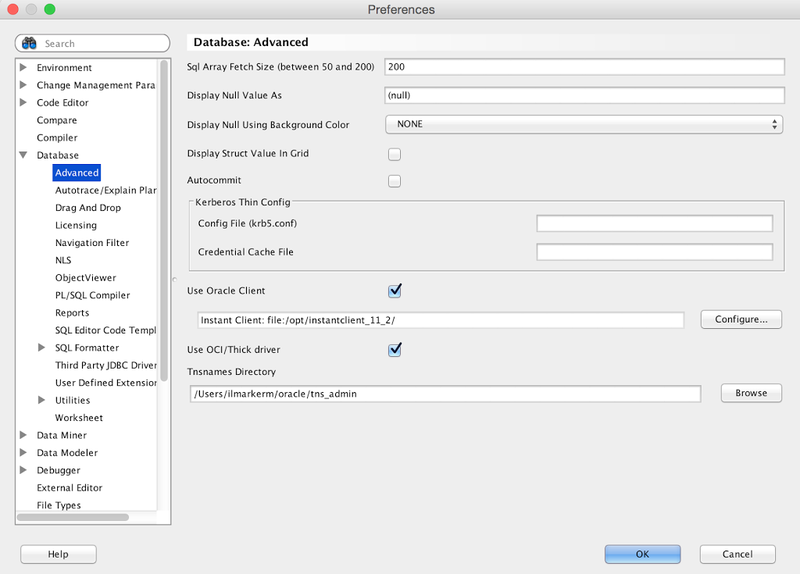 Jan Karremans just today published a similar article about Mac and Instant client, but the goal of my blog post is to get SQL Developer connected through Instant Client. First you need Java installed, I installed 64-bit JDK8, but it would be better to install 64-bit JDK7, since SQL Developer 4.0 is not supported on JDK8. When I’m writing this, SQL Developer 4.1 is in Early Adopter release and 4.0 is in production. I installed SQL Developer 4.0.3. 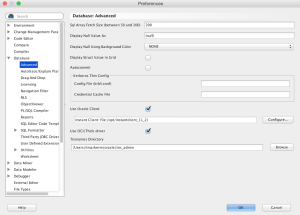 Open SQL Developer, open Preferences and go to Database > Advanced. Configure Oracle Client paths and check Use Oracle Client and Use OCI/Thick driver boxes. Here is the sample screenshot from my settings. When you press the Configure button to set the Oracle client path, there is also a button to Test if the Client was loaded correctly. Currently this test should fail. We need to set two environment variables: DYLD_LIBRARY_PATH to make sure applications can find and load the instant client libraries and TNS_ADMIN so instant client could find sqlnet.ora and tnsnames.ora files. In my case sqlnet.ora is essential, since I need to use Radius authentication. After restarting terminal and verifying that these environment variables are indeed set, execute SQL Developer app directly from terminal by executing open /Applications/SQLDeveloper.app/. Open preferences and press the Oracle Client Test button again, now the test should succeed and SQL Developer is connected through Instant Client. All good! Great success! 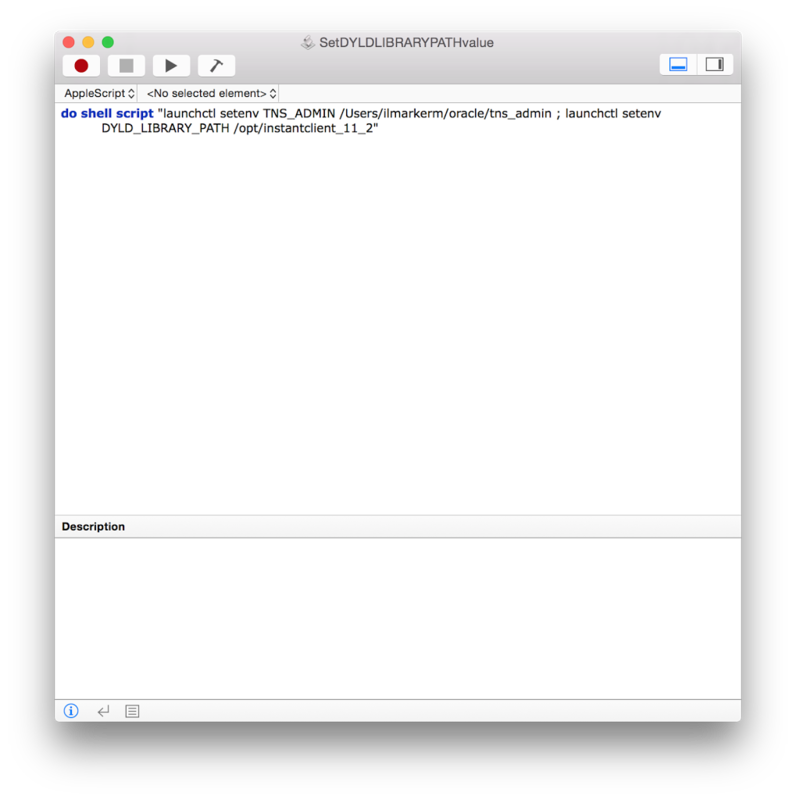 Guess again… Close SQL Developer and launch it from Docker/Launchpad and you will see the Oracle Client test failing again. This is because the environment variables under ~/.profile or ~/.bash_profile are loaded only inside Terminal. Yes, it is also necessary to set TNS_ADMIN, since setting the TNS admin directory path under SQL Developer preferences does not work if you need to use specific settings in sqlnet.ora, for example authentication. Save the script and in the save dialog set File format: Application. And finally System settings -> Users & Groups -> Login items press + sign and select the application you just saved. Now, log out from MacOS and log back in. Now SQL Developer should work with Instant Client even when you launch it from Launchpad. I got this method from a Stackoverflow thread.